Following are glimpses of people who have taken their geoscience backgrounds and pursued what might be defined as "alternative careers." What do you do? How did you get where you are now? I write about the physical sciences, including earth sciences, astronomy, chemistry, physics, math and archaeology. My path was less tortuous than that of many science writers. I got a bachelor’s degree in geology from the Massachusetts Institute of Technology in 1992, but decided I didn’t want to pursue a research career. I had always loved to write, and one of my English professors told me about a graduate program at the University of California, Santa Cruz, that trained scientists to become journalists. It seemed like an obvious combination of my interests, so I applied and got in. After graduating, I spent about a year freelancing for various magazines and newspapers, then landed a job as an associate editor at the now-defunct Earth magazine in Wisconsin. Soon I wanted to get back to writing, so I joined the newspaper world again. How do you use your geoscience background? My geology training gives me a head start in untangling the jargon of scientific papers and presentations. It has also given me a greater context for understanding the significance of developments in different fields. But during interviews, I usually don’t tell scientists that I have a scientific background. If I do, they start spouting polysyllabic words, none of which make for good quotes. What first sparked your interest in geoscience? In your current career? I took my first geology class because I wanted to get out of organic chemistry. We took field trips and played with minerals, and it seemed like a pretty good life to me. Then I did an undergraduate research project in igneous petrology, which taught me quickly that real research involves spending most of your time in the lab, not the field. My short attention span seemed better suited to journalism. But honestly — it’s very exciting to follow the news, to have access to the world’s leading scientists and translate those findings for my readers. Read. A lot. Develop a critical eye for what constitutes news. Become familiar with bylines and the types of stories that get published in various outlets. Work for free at your school or local newspaper, to develop a sense of news and to get clips. It’s important to understand the job market for journalists. Science journalism is a limited field, and seems to be getting smaller all the time. Many science journalists these days graduate from specialized training programs, such as those at UCSC, Boston University, Columbia University and elsewhere. Also check out the advice for beginning science writers at www.nasw.org, the home page of the National Association of Science Writers. Consultant at the Monitor Group in Boston, Mass. 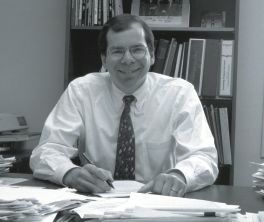 Geologic Roots: Double bachelor’s in geology and geophysics with economics and political science, Yale University, 1980; Ph.D. in geology, Harvard University, 1988; Carnegie Fellow at the Geophysical Laboratory of the Carnegie Instititution of Washington, 1988 to 1990; Director of Government Affairs, American Geological Institute, 1992 to 1995; Director of the National Academies’ Board on Earth Sciences and Resources, 1995 to 1999. I am a consultant at the Monitor Group, a firm that has been described as “a great place for optimists to try to change the world.” Monitor is a family of professional service firms, and its main strategy consulting practice tackles questions of strategic importance, such as corporate restructuring, mergers and acquisitions, growth strategies, and the assessment of new technologies and markets. My career spans academia, government and industry. Each sector provides different perspectives on major issues facing society and different opportunities for making a positive impact. Government Affairs at the American Geological Institute; and as a Congressional Science Fellow at the U.S. Senate Judiciary Committee. At Monitor, I welcome the opportunity to work with leaders of business to address issues that influence society. Many strategy consulting firms recognize the value of hiring “rocket scientists,” but relatively few recognize the value of hiring “rock scientists” who excel at working with incomplete data sets, integrating across specialties, and solving messy, real-world problems. What first got you interested in geoscience? In your current career? I have always been interested in the interface between science and public policy. As an undergraduate at Yale University, I double-majored in geology and geophysics and in economics and political science. I had such a good time that I repeated the entire experience. I was a Marshall Scholar at Oxford University, where I earned a B.A. in Philosophy, Politics and Economics (PPE), and then earned a Ph.D. in geology from Harvard University. I continued to pursue my interests in the geosciences while I was studying PPE at Oxford, and I continued to pursue my interests in the social sciences while I was studying geology at Harvard. While a geoscientist’s substantive expertise is useful in specific cases, the heart of his contribution may lie less in his mastery of particular disciplines than in his capacity for structuring complex problems, designing and carrying out detailed research protocols, conducting rigorous analyses, and applying the tests of sophisticated critical judgment to the results of those analyses. Research skills — numerical modeling of large data sets or analytical analyses of complex natural phenomena, for example — are rare and valuable beyond the academic community. Upper Rio Grande Water Operations Environmental Impact Statement Manager, New Mexico Interstate Stream Commission. Geologic Roots: A.B. 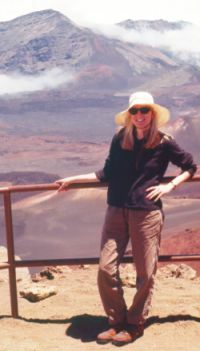 in geology from Bryn Mawr College, 1974; master’s degree in oceanography from Oregon State University, 1977; director of the U.S. Bureau of Mines, 1994 to 1996. After serving as director of the U.S. Bureau of Mines, I returned to my home state in 1997 and have been working in water resource management ever since. The last two decades have brought rapid growth to New Mexico, stretching the limits of its freshwater resources. My agency works with other agencies to deliver water to a growing population, ensure that water use meets environmental regulations, and see that each state get its fair share of water. I have mostly worked in engineering geology, and have dealt more with how resource development impacts the land and the regulatory compliance documentation for developing resources. For me, working with water resource development within the National Environmental Policy Act (NEPA), at a time when resource demand often exceeds supply, is a logical place to find myself. After working in Washington, D.C., I became convinced that I could do more good at the local level than at the top level of federal government. Because I directed an agency in the Department of the Interior, and that cabinet agency’s presence is so prevalent in New Mexico, I had even more motivation to work locally than if my home state were one without a large tribal population and resource base. In fact, I worked for three years on water resource planning for the tribal government of the Pueblo of Sandia. I have worked in appointed positions for tribal, state and federal government, which is pretty unusual for any geologist. But I enjoy being a geologist because it affords opportunities to be generous to society. A good knowledge of geography, both physical and social, is also helpful in understanding how water uses are viewed, from above the Colorado border, south into Texas, and into the myriad communities of New Mexico. I studied oceanography, which uses the interdisciplinary aspects of ecosystem science to develop an understanding of processes. My geology background already gives me the tools I need for making environmental assessments. What first sparked your interest in geoscience? I wanted to study foreign languages in college so that I could travel, but that would mean spending a lot of tuition to study literature in another language. So I switched to geology because it promised travel and was not a pre-med science. I have always been attracted to the new areas of geology, which I think made me more adaptable and better suited to be successful in government. I may have subconsciously chosen these opportunities for the pragmatic reason that in a new area of geology — such as oceanography was when I got my degree — the competition would more likely be among equals. Being both a female and African-American, I would have stood out less as being different, because all of us were new to that subspecialty. You must never turn down an opportunity because you don’t think it good enough for you. A geologist who went into government service very early, Gen. Colin Powell, describes in his biography that he once had a job sweeping a warehouse floor. Naturally, he thought that he was being underutilized for his skill level. However, he decided to have the cleanest warehouse floor, because you never know who is watching you. The world needs more people who care about doing a good job, period. Senior editor at Mountain Press Publishing Co., Missoula, Mont. Geologic Roots: Bachelor’s in earth science from the University of California, Santa Cruz, 1981; Master’s in structural geology from the University of Montana, 1989; Two years mapping parts of the western United States for the U.S. Geological Survey. Mountain Press publishes books on geology and other sciences, natural history, and history for lay readers. I review submissions, recommend and contract new projects, and work with authors and illustrators from the idea stage to the finished book. I guide authors and I edit for content, organization, substance and readability. I have edited books about geology, plants, animals, logging, meteorites, fishing and dinosaurs, and even children’s books about owls and loons. I love the variety and the opportunities to learn. I definitely did not come to this profession by any planned route. After finishing my graduate work at the University of Montana, I helped my husband build our home. On one trip to the hardware store, I bumped into Dave Alt, part-owner of Mountain Press. After small talk about hardware and the weather, Dave asked if I would like to work for Mountain Press pasting up maps and book pages and proofing text for the Roadside Geology series, which he co-founded. I said yes. After a year or two, I eased into editing geology and natural history manuscripts. Soon I was managing the geology and natural history books, as well as the topical science, outdoors and children’s nature books. I served as editor-in-chief for three years and am now senior editor. In the Ace Hardware parking lot that day, I had no idea I had found a job that combined English, art, education and geology, while allowing me to make sense of mild chaos. An editor does not need to understand the subject of a manuscript, but that knowledge can help. Many of the authors have only written for a professional audience. But they want to share with the public their excitement for and knowledge of geology. My broad education gives me a level of comfort with the physical sciences that many editors lack. While I don’t always know the answers, I can usually identify the questions. By the end of my first year at UCSC, I had taken classes in almost every subject, but I hadn’t found my educational passion. So I broke the news to my dad that I would take a year off from school to figure out what I wanted to study. Being wiser than his 20-year-old daughter, my dad said he’d accept my decision — but not until I had taken one class in every subject. We narrowed the untouched departments down to physics and geology, and I chose geology. I loved it and changed my major to earth science. If you are a student, look beyond the requirements for your major. Expand your education to include other sciences, humanities, social sciences and art. Read. Write. Talk with geoscience editors. Take an editing class. Read the types of books, journals or magazines you might like to edit. Intern for a geoscience publisher. And make sure you’re the one who runs to the hardware store. Environmentalist for Capital Environmental in Washington, D.C.
Geologic Roots: Bachelor’s in geology from Carleton College, 1967; Master’s in geology from the University of Minnesota, 1972. Four years ago, I joined Capital Environmental, a small consulting firm that is an affiliate of the law firm Howrey, Simon Arnold and White. I never expected to work for a law firm when I started in geology. My path to legal work was indirect, but built directly on my geological experience. During college, I worked as a field assistant for the U.S. Geological Survey’s Water Resources Division and got interested in hydrogeology. After working with the survey for 12 years, I changed over to consulting. Most of my work was with Dames & Moore, and one of their assignments had me serving as an expert witness for a toxic tort lawsuit. The defense, and my part in it, was successful, and I found I enjoyed matching legal wits with an opposing party. Another Dames & Moore assignment introduced me to Capital Environmental. I helped to develop an expert report for a legal matter to provide a rational explanation for an unusual pattern of hydrocarbon occurrence. I later joined Capital Environmental as a consultant and then as a full-time staff member. One aspect of my work I particularly enjoy is developing environmental histories for contaminated sites, research that involves aerial photographs, interviews with old-timers, the client’s files, and whatever historical documents we can find. We also use statistics to estimate potential cleanup costs for our clients. My geoscience background applies directly to the work I do now. It also gave me other skills, such as what I learned while working on computer databases in the USGS to organize information on lakes. Since then, for insurance recovery, I’ve organized information on locations and remedial costs of contaminated sites. The large amount of writing I did as a consultant honed my writing skills, absolutely essential in legal work. Carrying out investigations at chemical and manufacturing plants taught me what kinds of contamination they can produce. My father is an agronomist. He has always been interested in geology, and got me into rock collecting at an early age. We lived on several farms in Iowa and collected agates, geodes and fossils. I went to college planning to major in mathematics, but was able to take a course in mineralogy my freshman year. That, together with a spring field trip to the Black Hills, sold me on geology. Have as much varied experience as possible and work actively on developing a range of skills. In a legal setting, one has to be an environmental generalist. Work with computers, write, take short courses, attend meetings and read. Read general scientific publications, broad based environmental journals and journals in your specialty. Read about government environmental programs and regulations, which drive a great deal of environmental activity. Being varied, however, also puts me in danger of losing my geologic roots. Attending meetings is the best way to stay tuned in. Geologic Roots: Ph.D. in tectonics from MIT, 1992; George Mason University geology faculty for two years. My field of research, tectonics, became unfashionable and I began to look to other inspiring research topics. I chose nuclear waste disposal because I could still use my geologic training and apply it to an important problem. To switch from pure geology to applied geology, I needed research time. I earned a fellowship with the Bunting Institute for Advanced Study at Radcliffe College, which allowed me to make the change. During that year I spent most of my time at the Kennedy School of Government working with folks interested in nuclear policy. I extended my realm of interest from nuclear waste disposal to nuclear weapons disposal, especially plutonium management and disposal. I pursued a second fellowship at Stanford University’s Center for International Security and Cooperation. There, I earned a Social Science Research Council-MacArthur Foundation fellowship in International Peace and Security to work on Russian nuclear weapons plutonium management. I went back to Harvard’s Kennedy School for two years to pursue more training in the policy field. At this time I decided to resign from my tenure-track faculty position at George Mason University, a difficult and risky decision. When my MacArthur Fellowship ended, the technical research group at MIT’s Security Studies Program invited me to help expand their research effort. So here I am. Of course, I’m still not in a tenure-track position, although I hope to be. My career change limits me from working in geology departments. In fact, most of my geologist colleagues no longer consider me a practicing scientist, even though my work involves technical analysis. That’s the one frustrating factor of my career shift. The benefits are that I can directly or indirectly influence science policy decisions in this country and perhaps in others. Few independent scientists, and even fewer geologists, do this type of work in the international security field. It’s essential and differentiates me from the crowd, which is mostly physicists. For example, analyzing what waste form of plutonium is best for disposal requires knowledge of mineralogy, petrology and geochemistry. Most of the waste forms have natural analogues in the earth system. For geoscience it was a process of elimination: physics was too difficult, math too dry, biology too full of pre-meds, chemistry … well, chemistry was interesting (I got a minor in chemistry). But when chemistry could be combined with the outdoors, well that was a good deal. You can learn the significant issues in a policy field in about two years. Start writing on policy issues immediately. This forces you to do some research and some learning. It also helps to have the time to do this research, so a fellowship or postdoc is useful. CEO and co-founder of Pacific Microinstruments in Sierra Madre, Calif.
Geologic Roots: Bachelor’s in physics from Colorado College, 1990; Ph.D. in earth science (geophysics) from the University of California at San Diego’s Institute for Geophysics and Planetary Physics, 1996. During graduate school, my research group designed geophysics instruments and techniques that had direct commercial utility. The technology has not yet been successfully commercialized. Nonetheless, it provided me with the opportunity to make sufficient contacts in the business world and I was able to obtain a job in the private sector immediately after finishing my graduate program. I spent several years working at Kinemetrics, a leading provider of seismic monitoring instrumentation, where I had the good fortune to work on several successful product developments. Although primarily working as a technologist, I was able to learn the financial, marketing, manufacturing and quality systems that enable profitability in a competitive business environment. By late 1999, it was clear from market research that several convergent technologies were likely to disrupt the hand-held instrument market. Hand-held computers based on the Palm Operating System were gaining widespread acceptance and systems with expansion slots and wireless connectivity were set to launch. Meanwhile, the hand-held instrument market was rapidly growing and the enormous demand for cellular telephones was driving the rapid development of low-power and low-cost ICs. This created a unique and attractive entrepreneurial opportunity. So, along with two co-founders, I left my job and formed Pacific Microinstruments. Analyzing financial models requires many of the same quantitative intuitions as constructing models for earth science. It is helpful to understand which assumptions are controlling the model output and how uncertainties in these assumptions couple to form an uncertainty in the predicted profitability. A second and related advantage is the ability to rapidly calculate and estimate. This is required for negotiating on a tight time frame. From a technology point of view, geoscientists have been leaders in designing robust distributed systems on a global scale. These systems provide excellent real-world case studies in open-architecture measurement systems. During college, I spent a summer working for the Pinon Flat Observatory at the University of California at San Diego (UCSD). I worked on a 535-meter liquid tilt sensor that is still in operation. Another lab at UCSD had obtained funding for an ocean-bottom absolute gravity sensor at the time I was looking for a graduate program in physics. The great thing about geophysics vis-a-vis physics is that you can occasionally get out of the lab and into the field, and I was happy to give it a try. Luckily, I found that I was not susceptible to seasickness! I have had an interest in both business and invention for many years. An entrepreneur is a hybrid of the inventor and businessperson, so it is a natural extension. My particular interest in hand-held instruments is our vision that we can allow people to “get off the desktop” and interface with measurement and control systems while they are mobile. Obtaining private sector employment is easy enough. Starting a growth-oriented business is much more difficult. You’ll probably want to work in an existing business to learn the basics of a profit-making organization. Save some money and do not take on any unnecessary debt during this time — you’ll need money to live on after you quit your job and before you obtain funding or generate sufficient cash flow for a bootstrap. You’ll need to develop a vision, build a team, plan a strategy and develop a network of trusted advisors. When you’re convinced that the upside potential is worth the risk, don’t hesitate. Go for it. 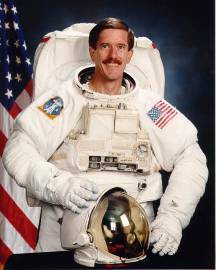 Mission Specialist Astronaut, NASA Johnson Space Center in Houston. Geologic Roots: Bachelor’s (1977), master’s (1987) and Ph.D. (1995) from the University of Texas at Dallas. Seventeen years working as a geologist. I’ve wanted to be an astronaut since I was a kid. During the early 1970s, when I started college, the only way to become an astronaut was to be a military test pilot. On a Navy scholarship, I studied aerospace engineering at the University of Texas. After the Vietnam War ended, the demand for pilots lessened, so I changed my focus. I figured I’d just get my degree and then fly for the airlines. I entered the university’s geoscience program, since I’d always been interested in geology. I earned my geology bachelor’s and then starting working on my master’s, doing field work in Antarctica. While working on my degree I was offered a position with a local petroleum exploration company as a part-time student geologist. This position eventually led to full-time employment, becoming a 17-year career that took me across most of the globe. But I never forgot my original ambition, so in 1985 I stopped by the Johnson Space Center and requested an application. For the next eight years I filled out applications while working on a Ph.D. sponsored by my employer. Finally, in 1994 I was invited in for an interview and began the final selection process with 119 of the most incredibly qualified folks I’ve ever met. Out of this group I was incredibly fortunate to be selected with 18 other U.S. astronauts to be part of the 15th group of astronauts selected since the original seven. The moral to this story is: Always believe in your dreams and don’t ever give up. You might not reach what you originally aim for but you’ll get the opportunity to do a lot of things you’ll really enjoy. Today, a large part of the space program is focused on diverse activities ranging from constructing the International Space Station to investigating the basic sciences in microgravity. Study and application of the geosciences — the interactions of chemistry, physics, structural mechanics, thermodynamics, etc. — means employing a multidisciplinary approach to problem solving. This same ability is a characteristic that most astronauts and cosmonauts possess. Also, in the future, missions to the Moon and Mars will have geological and geophysical investigations as some of the primary mission objectives. It will be vitally important for the explorers on those missions to have the ability to conduct reconnaissance and detailed field work. I’m not saying I should go, though I would be extremely pleased to; but the astronauts will need a strong and well-rounded background in geosciences to get the best scientific return. I remember being fascinated as a kid with the granitic intrusives in the area around my home in California. When it came time for me to find a new area of study in college, the short list was something in the natural sciences that I knew I would enjoy so the studying wouldn’t be like work. As it turned out, of course, the geosciences path led me to some fascinating places and experiences: to Antarctica, for example, and in deep-submergence vehicles to work on the links between the structural and geochemical environment and the conditions that support chemosynthetic communities in the Gulf of Mexico. Always pursue the things you truly enjoy. Work should never seem like work. If becoming an astronaut is your goal, then the more operation experience you have the better. Pursue jobs that allow you to design, build or operate equipment: designing or testing new hydrophones for hydrocarbon exploration, or designing and flying sensors on satellites, or working as an oilfield driver where you design tools and techniques for underwater tasks. Competition is keen for the few available slots in the astronaut corps. We select an average of 20 new astronauts every two years and we usually have around 3,000 qualified applicants. To be competitive it is almost mandatory to have an advanced degree. Most civilian astronauts have Ph.D.s or M.D. degrees and significant operational experience. The last piece of advice is to be persistent. Very few applicants get accepted on their first try. Many of us worked for years just to get the interview. Don’t ever give up. 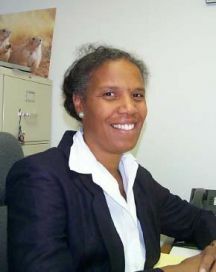 Physics teacher, Windward High School in Los Angeles, a private school for grades 7 through 12. Geologic Roots: Bachelor’s in geology at Texas A&M University, 1991. Master’s in geology from the University of Wisconsin-Madison, 1993. My work at the University of Wisconsin concentrated on the chemical evolution of magmatic systems during crustal extension, in the Death Valley region of the western United States. As a graduate student there, I taught several undergraduate lab classes and served as head teaching assistant, which I found to be a lot of fun. When I left Madison I knew I did not want a job in industry, so I applied for a teaching position at several private schools around the Los Angeles area. In my first position I taught chemistry and AP Chemistry and have slowly moved into teaching physics since then. Texas A&M requires that geology majors take an unusually broad and deep array of science and math classes, which is excellent since geology is just an application of physics and chemistry. This background has allowed me to teach a wide array of classes from physics to chemistry to geology. In graduate school you realize that all the facts you learned about a subject are relatively unimportant compared to the ability to critically analyze a problem and to think through that problem logically. I believe these skills are like any others and can be developed with practice. Working through a real scientific problem for my thesis has convinced me that children should learn science as it is actually done, through hands-on experimentation. What first sparked your interest in geoscience? In your current position? What advice do you have? When I was first in college I could not decide between physics, chemistry, geology or philosophy. When I realized that geology would let me wander around in the mountains, my decision was made. Later in graduate school when I realized the time commitment young professors have to make to get tenure, I became disillusioned with a college academic career. I also had an interest in doing something that might be helpful to the world, so I decided to try secondary-school teaching. Teaching is much harder than you might think. Imagine giving three or four different lectures everyday to audiences whose initial attitudes range from very interested to very uninterested. But the rewards are also great. Cultivating a student’s curiosity about the world is quite satisfying. Of course the pay is not good (sports stars are 100,000 time more important than a teacher), but with three to four months off every year you can pursue lots of outside interests and remain a human being. I was an intern for Sen. Jeffords the summer between my sophomore and junior years of college. It was a fantastic experience and I kept in touch with several staff members. 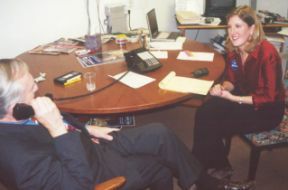 After a post-graduation government affairs internship at the American Geological Institute, I was hired as a Legislative Correspondent (LC) in the Senator’s Washington office. I worked as an education policy research assistant after Jeffords became chair of the Senate Health, Education, Labor and Pensions Committee. But when the position of Deputy Press Secretary opened in March 1998, I knew it was a perfect fit. I also worked five months as the Senator’s press secretary during his recent reelection campaign. I first became interested in working on Capitol Hill because it’s a fast-paced, exciting environment, offering different challenges every day. Studying geology, I learned to think analytically, to address problems in a quantitative manner and to look for logical solutions. It may not be obvious at first glance, but geology has helped me immeasurably in my career. My first geology class was challenging, exciting and dynamic. My professor challenged us to think about science and about the world around us in new and different ways. Make personal connections with people on a House Member’s or Senator’s staff. As in any field, personal relationships go a long way. If you can, volunteer to work on a campaign or apply for a fellowship or internship. Utilize your strengths: look for positions on science related committees or in the government affairs department of a scientific organization.